A new year brings a new President and a new Leadership Team. 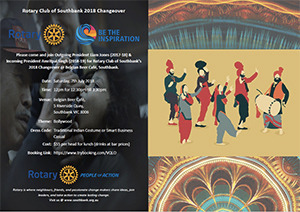 Join the Rotary Club of Southbank as we celebrate in Bollywood style. Date: Saturday 7th July, 2018, 12pm - 4pm.